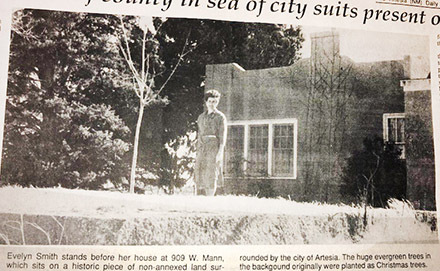 Looking back 40, 30 and 20 years ago, the following are excerpts from the Artesia Daily Press from Jan. 14-20. Members of the Talespinners Junior Story League had a contest for the best 1950s costume Tuesday evening in the home of Stephanie Lawson. The winners were Vickie Troublefield, first; Nancy Youtsey, second; and Michelle Allen, third. As reported in the Pinon News: Hunter smith started to the Smiths’ ranch southwest of Pinon Friday and it was so muddy he had to turn back. Sunday, he got to Pinon with plans to try to again go to the ranch, but decided to call Bryan Prather living in that area and Bryan reported the roads were impassable, and that Hunter could not get to the ranch. Leon Ham hauled a load of water early Sunday morning from the W.A. Gage well on slightly frozen ground, then after services of the church he went to take the truck back and got stuck and had to bring the truck back to Pinon. The Timberon school bus was unable to run last week because of bad roads. The Artesia Bulldogs forced Tularosa into a man-to-man defense in the fourth quarter Saturday and turned a tight basketball game into a 13-point victory for the ‘Dogs at the buzzer. Artesia upped its record to 7-5 with a 64-51 win over Class 3A rival Tularosa, despite playing without two starters — Bobby Juarez, who had the flu, and Henry Saiz, who is nursing a turned ankle. The year 1978 was a modern-day record for the Artesia area in terms of precipitation, according to figures compiled by the New Mexico State University southeastern branch agricultural station. The station recorded 25.55 inches of precipitation in 1978 at its collector about three miles southeast of Artesia. That is over twice as much as the 11.52-inch annual average since the station first started recording annual rainfall in 1958. The next wettest year in the past 21 years was in 1958, when 18.95 inches of precipitation were recorded. That year is followed by 1974, in which the station tallied 18.51 inches. Ricky Garcia received a crisp $50 bill this morning form Henco Inc. for being the top seller in the company’s district of the candles sold by the Artesia High School band. Garcia out-sold all the students in southern New Mexico with 177 candles. Henco zone manager Dave Buhman presented the bill to Garcia. “Sgt. Pepper’s Lonely Hearts Club Band” was the featured movie of the week at Landsun Theater, while “Which Way is Up?” and “The Choirboys” were the featured movies at Hermosa Drive-In. 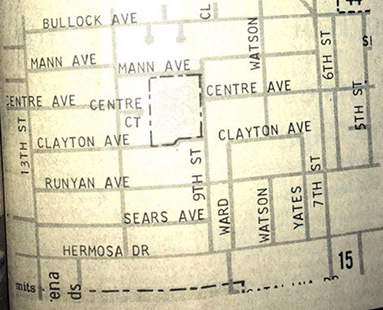 Have you ever looked closely at an Artesia city map and wondered about a little tract square in the middle of the south part of town? It’s a peculiar blank spot that somewhat resembles the shape of New Mexico on a map of the nation. No, it’s not a “little New Mexico.” And it’s not an oversight that occurred when the maps were printed. The fact of the matter is, this small piece of property is actually not a part of the city. No, the family living there did not secede from the city. The simple explanation is that this property was never annexed into the city. W. E. “Elmer” Jeffers, who owned the property for many years, did not want to be annexed into the city. In fact, according to stories about the man and the property, he was extremely emphatic in his desire not to be annexed. As reported in the Pinon News: Mr. and Mrs. Alton Daugherty have been ill for several weeks. Friday, Mr. and Mrs. Frank Scott went to their home, and Mrs. Scott did some cleaning for them. They all went to the Weed Café for lunch and they found Mr. and Mrs. Don Merritt there, as they had worked at home all morning and were tired and wanted to get away for a while, so they went to the café for lunch. “My Stepmother is an Alien” and “The Naked Gun” were the featured movies of the week at the Cinema Twin theater. Artesia and Roswell residents have been experiencing some frightening and exasperating scares as a result of frequent sonic booms in recent months. Artesia felt three such booms Tuesday morning. Big Chief Gun and Pawn Shop had a store front window shattered. Replacement of the window cost $400. Roswell merchants also reported some broken windows. Commander Robert Pepper of Holloman Air Force Base said Tuesday that Holloman did not have any aircraft flying in this area at the time of the booms. He said one F-111 jet out of Cannon Air Force Base was in the area. The Public Affairs Office at Cannon would not deny or confirm that the base had planes in the Artesia area Tuesday but agreed to look into the situation. After a three-game losing streak, the Artesia Lady Bulldogs bounced back Thursday evening to “layup” the Lady Warriors, 57-28, in the first leg of a three-game marathon that continues tonight against Carlsbad and ends Saturday night against Gadsden. Despite the lack of two of their undisputed better players, Jeannine White and Stephanie Clark stepped up and played some very strong ball. “In your face, Carlsbad!” That was the general sentiment from the Lady Bulldogs after the Cavegirls had made it known how bad they wanted to defeat the Lady ‘Dogs, “…on their floor, on their brand-new court,” as Cavegirl guard Ora Hensley put it in the Carlsbad Current Argus, hoping to avenge a home-court loss to the Lady ‘Dogs earlier in the season. In the end, it was the Lady ‘Dogs who would win the latest battle in the “Eddy County Wars.” As one fired-up Lady ‘Dog put it so well, “If she wants to win so bad, why can’t she score more than six points?” referencing Hensley’s score in Friday’s game. As reported in the Pinon News: The Pinon people have been quite busy working on the churches here. The minister, J.D. Craft and his wife came from Artesia one day the past week and helped the members of the Baptist Church clean the Baptist Church’s buildings. Park Junior High School eighth-grader Stacia Givens designed a greeting card for the CBS Southwest School Works’ “Design a Holiday Card” contest. She was one of three students chosen in the state. The cards were used as television station identifications during the holidays. Winners received a savings bond. Hundreds of designs were submitted.